Speaking at CatholicCare’s annual Parker Moffit Bequest Society event last week, our Spiritual Director Fr Gerard Dowling recalled his mother’s wise words on the importance of gratitude. It is advice that CatholicCare took to heart as we gathered our bequest society members to thank them for their support. We also honoured those who had passed away during the previous year; whose gifts in will to CatholicCare are a testament to their commitment to helping others to live ‘life to the full’. With International Women’s Day only two days away, guests heard from CatholicCare CEO, Netty Horton who spoke about our inspiring founders Norma Parker and Connie Moffit and their journey in establishing CatholicCare as a social service agency. She also spoke about other inspiring women in the charity sector and discussed her own experience working within it. 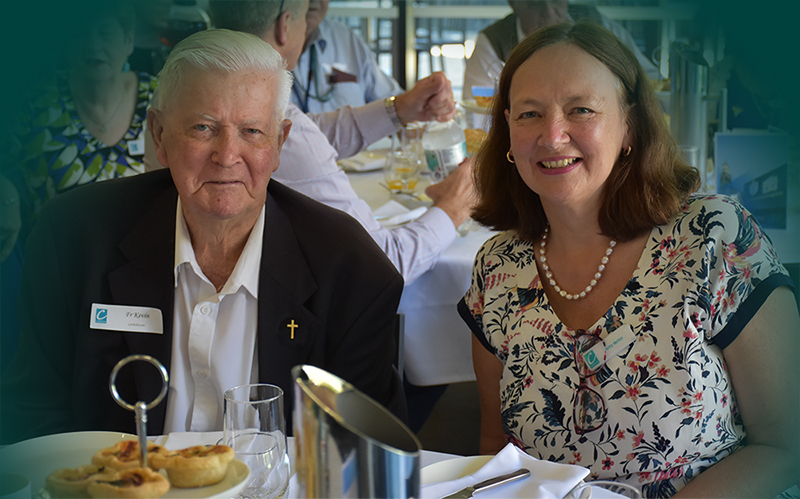 Guests also heard from Board member, Dennis Torpy, and Emeritus Board member, Fr Kevin Mogg, before joining CatholicCare staff to enjoy high tea. The Parker Moffit Bequest Society was established to acknowledge the support of our donors and bequestors. The Society provides an opportunity for our supporters to learn about our programs, hear about the impact of their donations, and to meet with other like-minded philanthropists. Read more about the Parker Moffit Bequest Society. Above: Fr Kevin Mogg with CatholicCare CEO Netty Horton.